“We oppose this coup of history, withdraw the alterations to the national history textbook!” shouted university students at the rally in front of Marronnier Park on October 31st, 2 P.M. University students have added their voices in opposition to the government’s decision to change the present system of using government (Ministry of Education) approved history textbooks to a standard one used nationwide. Despite the fact that opposing opinions steadily increased, on November 3rd, the Ministry of Education made an official announcement of authorizing a national history textbook. Starting from 2017, students across the country will learn history using the one unified history textbook. 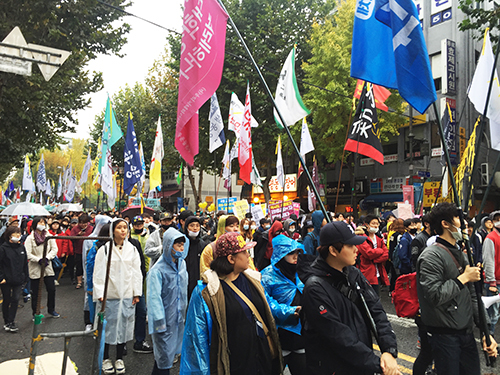 Yet, opposing opinions does not seem to subside, as a massive rally with around 130,000 demonstrators from 53 labor unions and civic organizations was held in Seoul on November 14th. On October 12th, the government announced plans to proceed with replacing present approved history textbooks to a national history textbook. In 1992, the Constitutional Court ruled that regarding the publishing system for textbooks, an official approval of the Ministry of Education system was more suitable than a government-controlled system; free issue system is than official approval system in accordance to the spirit of the constitution. Therefore, the government started its reformation, pursuing a free issue system from 1995. However, oppositions to the free issue system arose. Thus, in 2007, the government passed an official approval system for history textbooks. This official approval system for history textbook means that the Ministry of Education establishes guidelines for the contents that must be included in the textbook. Then, the writers and publishers are free to write contents of the textbooks within the framework of the Ministry guidelines. Until the present day, this system has continued, but now this system will be going back to the government-sponsored system, in which only one kind of history textbook will be published and passed on to schools. President Park Geun-hye and the Saenuri present ruling party firmly stressed the necessity of a government-controlled publishing system for history textbooks. The main argument is that present history textbooks are excessively skewed to the left, praising Kim Il-sung’s Juche Idea. Such supporting opinions are posited by the president, Saenuri Party, Korea Parents Federation, and other conservative organizations. Such remarks and the government’s unilateral decision caused outrage and disagreement from the opposition parties, many history scholars, and faculties in academic fields. As more and more people and organizations in academic fields had shown their opposition publicly, this in turn has led the opposing opinions among the public to also steadily increase. In fact, recent opinion poll made by Media Today showed 56.5 percent of people opposed national history textbook, while 35.4 percent agreed. This shows that the opposing opinions drastically increased compared to the one in the beginning of the administration notice (A poll made by Money Today showed agreeing opinions marked 47.6 percent, while disagreeing opinion was 44.7 percent). The main reason for opposing national history textbook is that it will eventually lead to the idealization of dictatorship and of pro-Japanese actions. Beginning with 13 professors of Yonsei University, 2,648 professors from 170 universities have expressed their opinion against the national history textbook. Accordingly, 27,000 school teachers contributed to the declaration of objection regardless of disciplinary action from Ministry of Education. On September 23rd, 65 professors from Dongguk University also issued a statement to express their opposition to the government’s move to a national history textbook. ▲ Hyeon Da-eun, the organizer of“Group of Donggukians against National History Textbook,”is making her speech at the“Protest of University Students Against National History Textbook”on October 31st. Yet, a large number of university students are actively taking part in opposing the national history textbooks. A hand-written poster of a student of Yonsei University, which sarcastically denounced the current assertions of the government on its reasons for a national history textbook by using a North Korean accent, became a huge sensation through SNS. It not only was entertaining but also raised interests in this issue. Starting from Yonsei University, students from Korea University, Seoul National University, and Kyunghee University attached posters to convey their points of views. Dongguk University was no exception on this movement. Students who considered this issue to be serious started to write their opinions on posters, and then they attached the posters on the school bulletin boards. These posters did not get much attention at first, but as time went by, more and more Donggukians participated and stated their opinions. ▲ University student demonstrators against national history textbook are marching through the streets from Marronnier Park to Gwanghwamun Plaza at "11.14 Public Rally." In Dongguk University, there is an opposition group called “Group of Donggukians Against the National History Textbook.” This group made a Facebook page to post the reasons why they are against these new textbooks and to share information regarding the issue. 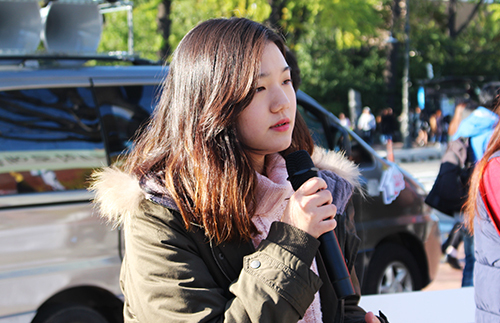 On October 31st, “Protest of University Students Against National History Textbook” took place in Marronnier Park and Cheonggye Plaza. In this protest, students from several universities addressed their opinions on this issue and “Group of Donggukians Against the National Textbook” also participated in it. 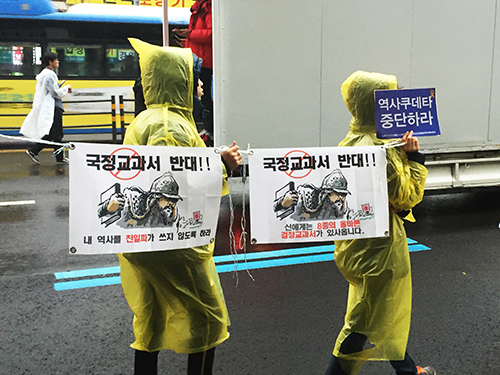 In addition, a “Public Rally” happened in Marronnier Park and Gwanghwamun Plaza on November 14th. University students from diverse universities, including Dongguk, had a “Youth Rally” in Marronnier Park at 2 P.M. and then they joined the “Public Rally” at 4 P.M. This rally lasted for 7 hours, until 11 P.M., participants and the police physically confronted during this rally. The police blasted the demonstrators with water cannons, and an old farmer got hit and lost conscious.